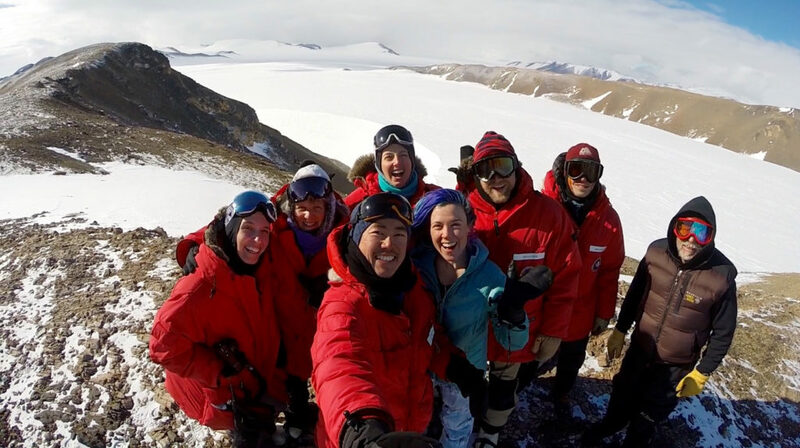 November 15, 2016 – Dr. Constantine Tsang, a senior research scientist at Southwest Research Institute (SwRI) in Boulder, Colorado, was one of eight expedition members during the 2015-2016 Antarctica Search for Meteorites (ANSMET) campaign. His team searched for meteorites between McMurdo Station — the prime U.S. research center in Antarctica — and the South Pole, and found 516 meteorites that will be studied by scientists for years to come. Meteorites are natural objects that fall to Earth from space and survive intact so they can be collected on the ground, or — in this case — on ice. Antarctica provides a unique environment for the collection of meteorites, because the cold desert climate preserves meteorites for long periods of time. Movements of the ice sheets can concentrate meteorites in certain locations, making them relatively easy for scientists to find. Meteorites come from a variety of places in the solar system. Most meteorites originated on asteroids, which are remnants of the materials from which the planets formed. Meteorites collected by ANSMET have been determined by scientists who study them to come from dozens of different asteroids. Studying Antarctic meteorites helps scientists learn more about the primitive building blocks of the solar system and answer questions about Earth’s neighbors like the moon and Mars. Impacts of asteroids on the ancient Earth and other bodies in the solar system may have played a significant role in the delivery of volatiles (like water) and organic molecules (such as amino acids) to planetary bodies, which, in turn, could have been important to the development of life. A few meteorites originated on the moon and Mars -— blasted off the surfaces by large asteroid impacts and later falling to Earth. The lunar meteorites may come from parts of the moon not visited by astronauts in the 20th century, and they extend our knowledge of Earth’s companion and how it formed. Martian meteorites are humankind’s only specimens of rocks known to be from another planet. We know they come from Mars by studying their ages and compositions, and comparing their properties to measurements taken by U.S. robotic missions to the surface of Mars. 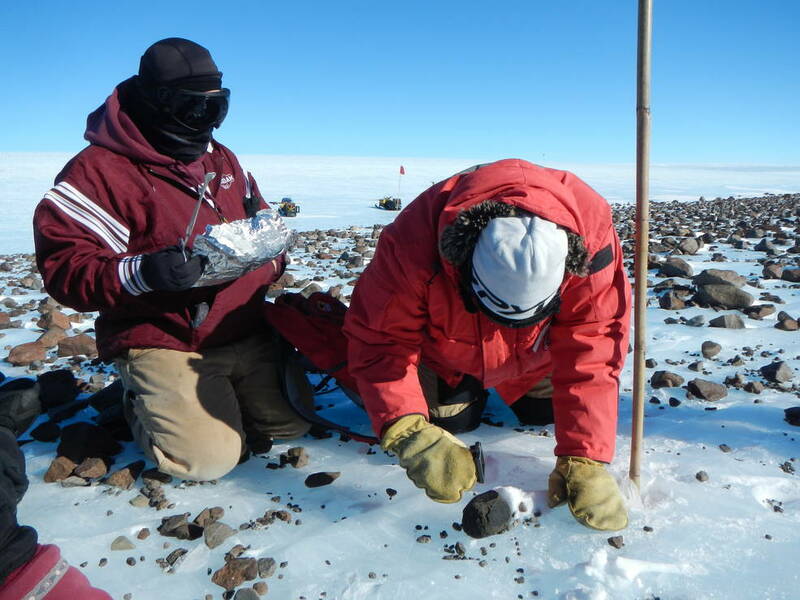 To search for meteorites, ANSMET deploys small field parties during the Antarctic summer (winter in the northern hemisphere). Even in summer conditions are harsh, with temperatures dropping to well below zero degrees Fahrenheit (-18 degrees Celsius). The ANSMET teams are flown to remote areas, where they live in tents on the ice and search for meteorites using snowmobiles or on foot. Since the U.S. began searching for meteorites in Antarctica in 1976, the ANSMET program has collected more than 23,000 specimens, dramatically increasing the number of samples available for study from Earth’s moon, Mars and asteroids. Among them are the first meteorites discovered to come from the moon and Mars, and the well-known ALH 84001 Martian meteorite, which helped renew interest in Mars exploration in the 1990s. Meteorites in Antarctica may only be collected for the purpose of scientific research. Under U.S. law, they must be properly collected, documented, handled, and curated. Logistical support to the collection teams while in Antarctica is provided by NSF, which manages the U.S. Antarctic Program. ANSMET meteorites are characterized and curated jointly by NASA and the SI. They are made available by NASA and the SI for study by scientists in the U.S. and around the world, which has resulted in thousands of scientific publications since the program began. NASA, the National Science Foundation (NSF) and the Smithsonian Institution (SI) recently renewed their agreement to search for, collect and curate Antarctic meteorites in ANSMET. The signing of this new joint agreement advances the program for an additional decade, replacing an earlier agreement signed in 1980. Because meteorites are representative of objects than can (and do) hit the Earth, much of the funding from NASA for the collection of Antarctic meteorites is provided by its Planetary Defense Coordination Office, supported by its Near Earth Object Observations (NEOO) research program.